is the only event of its kind where over 2,000 attendees from around the world come together to build relationships, solve problems, embrace new ideas and drive new revenue with robotics. * Access Exclusive Insights & Market Forecasts from Analysts & Top DevelopersPLUS, see HUNDREDS of robots from around the world in action at the RoboBusiness Expo. 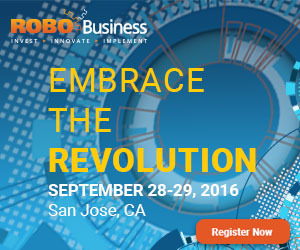 Save 10% when you register by using code RB16IEEE Learn More: robobusiness.com; to be held on September 28-29, in San Jose.